We have 154 open source systems in our ranking, slightly less than the 156 commercial systems. 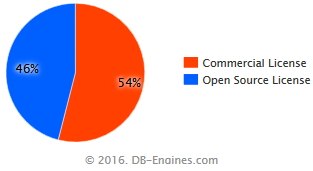 If we add up the popularity scores of all the open source systems, we get 46% of the overall scores, whereas 54% goes to commercial systems. While commercial systems are leading, looking at the historical trend makes us think that this is going to change. 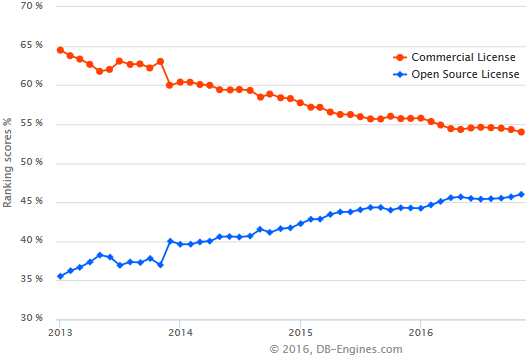 The popularity share of open source systems increased from 35% four years ago to its new record of 46%. But where does this change come from? It's not like the Oracles, Microsofts and IBMs of the world are slowly open sourcing their core technologies. There are actually two main factors. First, the popularity trend of established commercial systems shows a mixed picture. Oracle has been our DBMS of the Year 2015, as the system that saw the biggest increase in popularity. Similarly, Microsoft SQL Server had a very strong year so far, gaining 91 scoring points in the last 12 months. On the other hand, competing commercial systems lost popularity, for example DB2 and Microsoft Access. The established open source systems did better on average. MySQL had its ups and downs, but showed a strong upwards trend again recently. Also PostgreSQL, SQLite and MariaDB are all consistently gaining in our ranking. So, that is one source of the trend we observe: established open source systems are doing somewhat better than their commercial counterparts. But the more significant underlying reason is something else. 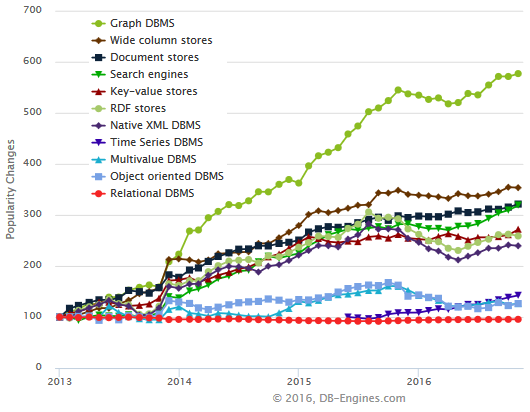 On the left we see mostly relatively new types of systems with a very high share of open source systems: Wide Column Stores, Graph DBMS, Time Series DBMS, Document Stores, plus the not-so-young category of Key-value Stores. On the right we find relatively mature types of systems with a high share of commercial systems: Multivalue DBMS, Object Oriented DBMS and Native XML DBMS. Relational DBMS are somewhere in the middle. On the top with the highest growth rates we have the same types that have the high share of open source systems, whereas at the bottom, the systems with the slowest growth rates tend to be the models where commercial systems dominate. All of the top Wide Column Stores are open source: Cassandra, HBase, Accumulo and others. All of the top Graph DBMS are open source: Neo4j, OrientDB, Titan and others. All of the top Key-value Stores are open source: Redis, Memcached, Riak KV and others. All of the top Time Series DBMS are open source: InfluxDB, RRDTool, Graphite and others. 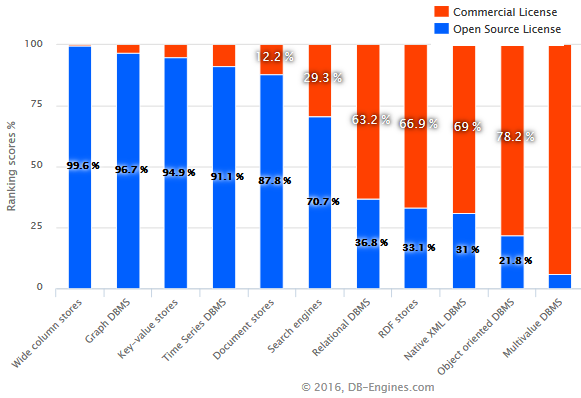 Most of the top Document Stores are open source: MongoDB, Couchbase, CouchDB. The notable exception here is Amazon DynamoDB, a cloud-based system, which hints at another trend. Finally, also the top Search Engines are open source: Elasticsearch and Solr. The trend towards open source DBMSs seems to be unstoppable. That is good news for the DBMS industry. It means a huge choice of powerful yet inexpensive solutions for users. On the other hand, plenty of companies have proven beyond doubt that it is possible to build a solid business based on open source systems, by providing all the products and services that are needed on top of the core systems. Commercial systems are not going to disappear any time soon for those who need or prefer systems with that type of licensing. The database landscape certainly is large enough for all kind of animals.